Cricket and I used to do a two mile walk around the neighborhood, when the weather was right and we’d been cooped up too long in the house. I’d fill a bag with her necessities: a Tupperware cup full of water, extra poopie bags, and a paper towel or two in case of emergencies. Cricket knew that a bag like that signaled a long walk and once she had her leash on, she raced down the stairs with the leash flailing behind her and jumped up to reach the door knob with her nose. She had to wait for me to turn it, though. 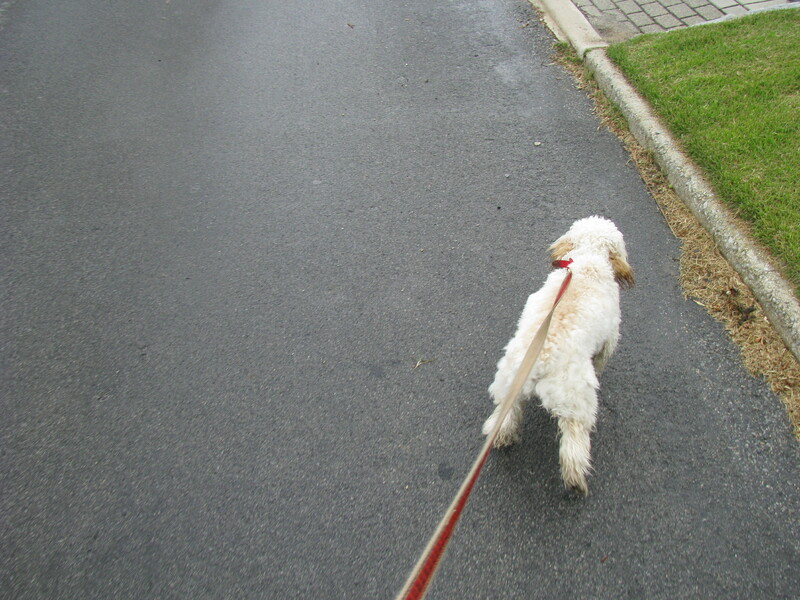 The first few minutes of the walk were a blur of effort for her, dragging me, like a horse with a plow, past the corner and down the block until we had truly reached THE WALK ZONE, which was at least a block past the shorter PEE ZONE. Then Cricket could focus on her sniffing without fear that it would all end too soon. Walking smoothes out her brain chemicals, and the neighborhood fills her up with smells and experiences that keep her mind busy for hours afterwards. She doesn’t mind hot weather, or cold weather. In fact she would drag me out in ice and snow if she could, though not rain, raindrops are like poison darts on her head. Walking with Cricket helps to calm me down, too. If I wake up anxious, which I usually do, with twenty different ideas of what the day should hold running through my head, I take Cricket out for a walk, and burn off the extra energy. Walking with Cricket, instead of on the treadmill, has the added benefit of forcing me outdoors, where there are beautiful things to look at. My neighborhood is especially beautiful, filled with dogwoods and maples and birds and flowers, and the ground isn’t flat, so when we go up and down the hills, we get a whole new look at the view. I still try to take Cricket out on her walks around the neighborhood, but in the forty-five minutes it used to take to do two miles, I can barely do one. Some days, I just walk slowly. Other days, my legs go wonky, and I look like a marionette. My hands curl up and my face twitches. On those days, walking uphill is like climbing Kilimanjaro and walking downhill is a race against gravity. The doctors don’t know what’s wrong with me, but Cricket doesn’t mind if I walk funny. She runs circles around me when I’m slow, and gets twice the exercise in the same amount of time. Or she goes out with her Grandma, and barks all of the details of her adventure to me when she returns. I wish I could put her on the treadmill to help her burn off the energy left over after her shortened walks. I worked on that with her when she was little. I built her up gradually, from standing on the unmoving treadmill, to walking at the slowest speed for two minutes. But then, abruptly, she changed her mind about the experiment. Maybe she decided that she didn’t like the ground moving under her feet, or she didn’t see the point of a walk with no peeing component and nothing to sniff. My dream is to be healthy enough to take Cricket out for the longest walk she can stand. She will empty her bladder so completely that even she can’t believe she has any more pee left to give. She’ll drink all of the water in her Tupperware cup, and meet as many dogs as she can. And then, without any prompting from me, she will look up and say, Mommy, I’m ready to go home. 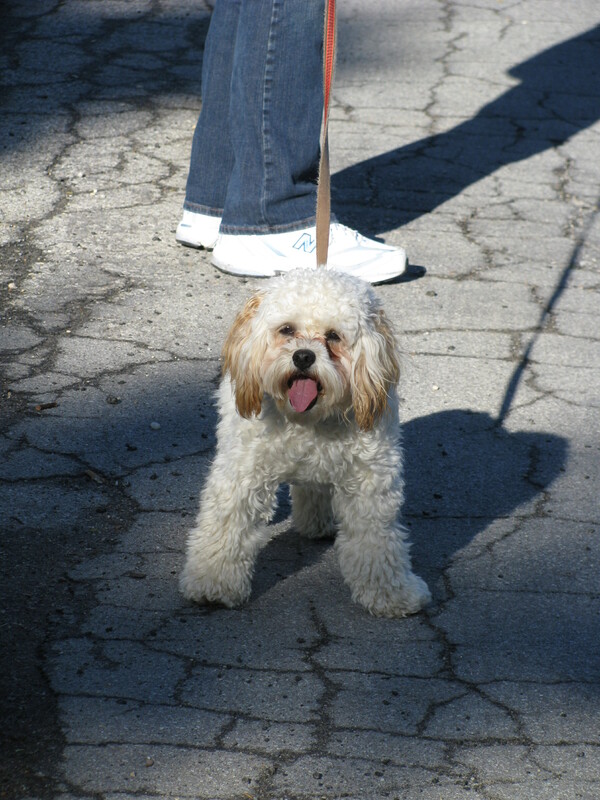 Posted in dogs, memoir and tagged dogs, family, health, memo, memoir, treadmill, walking. Bookmark the permalink. I hope so too. Cricket is getting bored with all the fun nap time, she wants to climb a mountain. or two. Oh I feel for you. I so hope the doctors figure out what’s wrong. The one good thing with a dog is, as you say, they force you out into the open air. Wishing you all the best for a decent diagnosis and a speedy recovery. I love walking my dog, too! I’m such a hermit, but I’ve been told that I actually walk my dog too much. LOL. I can’t imagine Cricket complaining about too much walking. She thinks she’s a marathoner in a tiny dog suit. Hope you’re quite well again and that those long walks are happening with ease! Not yet, but ever hopeful!